Meet Damien Mander. Six-foot-something, tattooed, ex-Royal Australian Navy clearance diver/Special Forces commando/private security contractor, Mander seems to have been written for a late night TV movie special. He’s big, bolshie, crass and delightfully full of it, but Mander has managed to avoid what would certainly be a successful future in bad television, instead, turning his military experience in the Middle East towards a more useful pursuit – conservation. I was engaged by the IAPF to provide them with photographs that could be used for promotional, fundraising and media purposes and spent several months in 2011 documenting their activities. The following images represent a selection of that work. 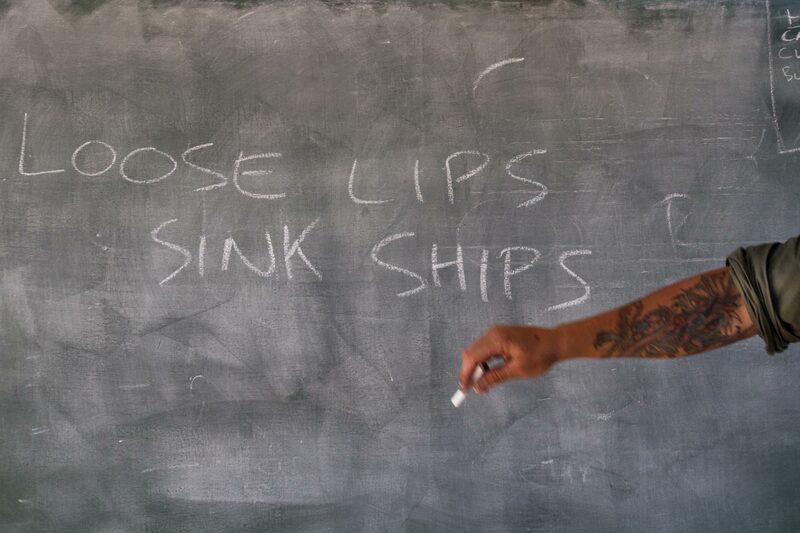 IAPF CEO Damien Mander teaches a lesson on Operational Security (OPSEC). An ex-Royal Australian Clearance Diver and Special Forces commando, Mander's resume includes training the Iraqi police as a security contractor in the Middle East. In 2009 he set up the International Anti Poaching Foundation in Victoria Falls, an Australian charity, to contribute his military expertise to the fight against poaching. Operations Manager Steven Dean camouflages a weapon before a night patrol exercise. 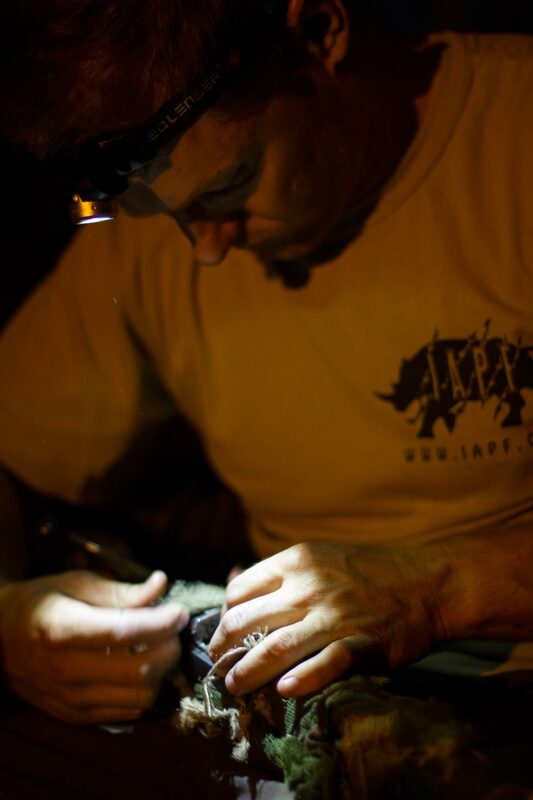 Like Mander, Dean left a career as a private military contractor in the Middle East, sinking his savings into the IAPF to get it up and running. 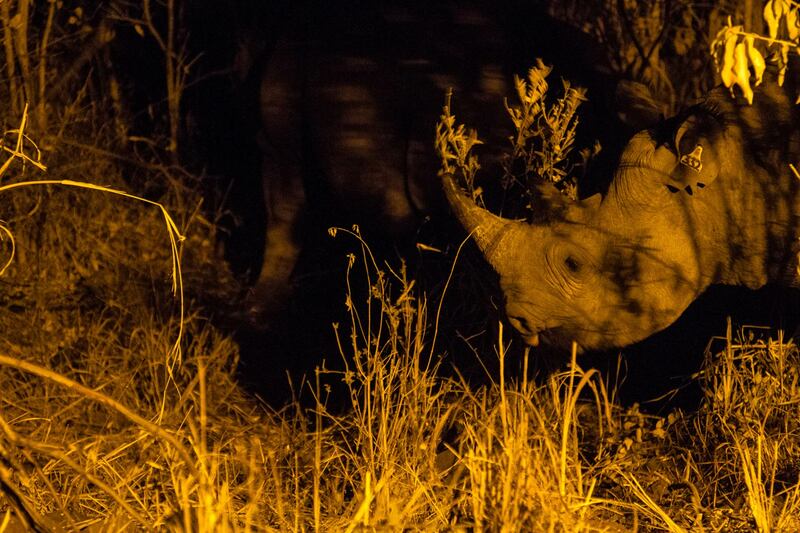 A black rhino makes its way through the dense bush at night. Black rhino prefer thick scrub and bushland making anti-poaching efforts for this species of rhino particularly challenging and dangerous. 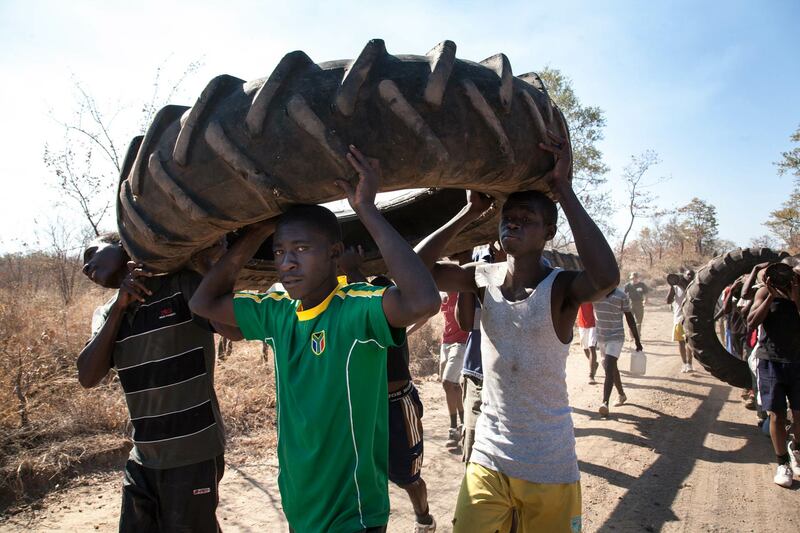 Teams of hopeful applicants carry tyres on the morning of an IAPF recruitment for new rangers. Around 200 people turned up for the day-long trial which included physical and mental aptitude tests. 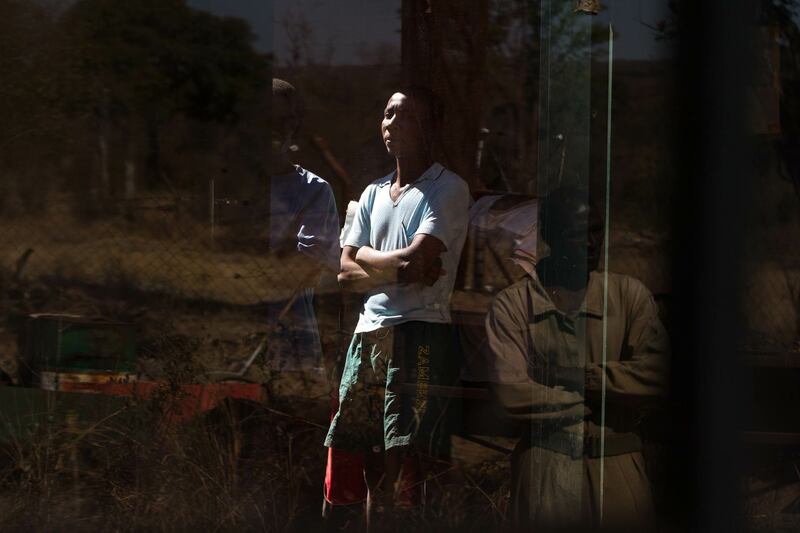 The IAPF model presents a self-sustainable organisation, using funding from tourism on the property itself to provide training and employment for members of the local community. 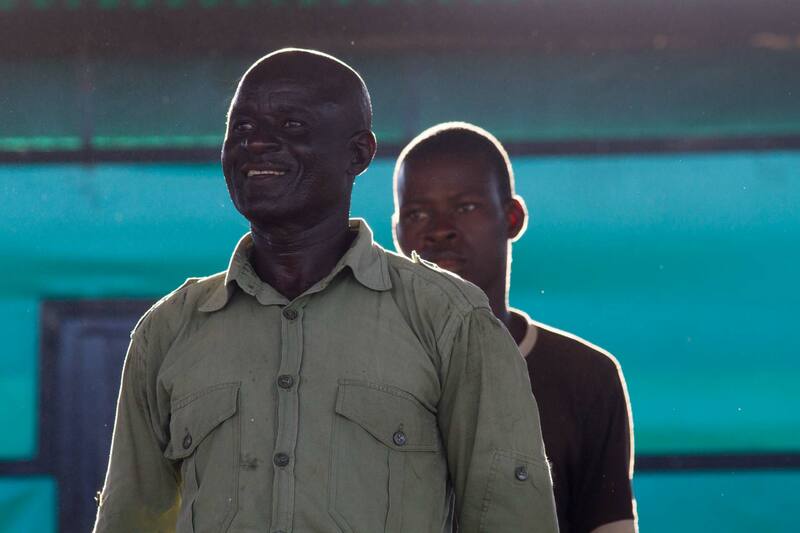 Ranger Tyson Mupande keeps an eye on applicants waiting for a test to begin. Though the recruitment was a success for the IAPF, the scores of applicants highlighted how desperate people are for work; a desperation which poaching syndicates may use to their advantage. New recruits practice drilling in the late afternoon light. 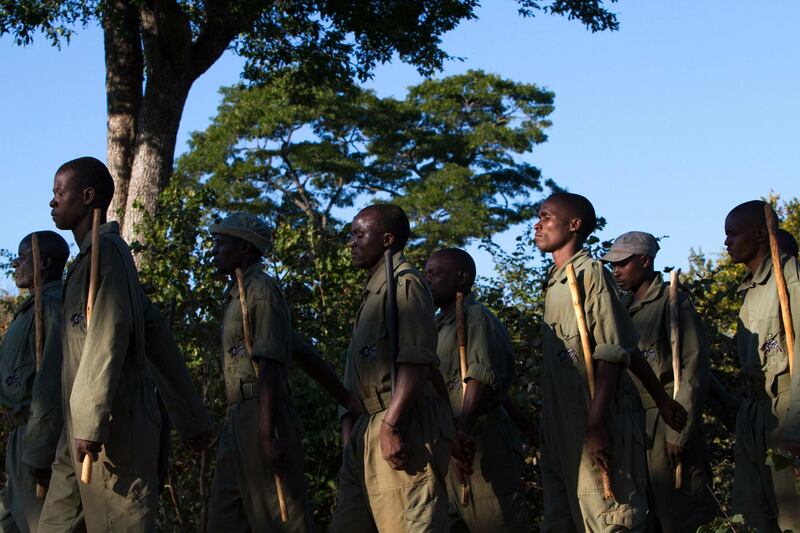 All 16 rangers who completed this course gained employment either at the IAPF itself or at other reserves across the province. 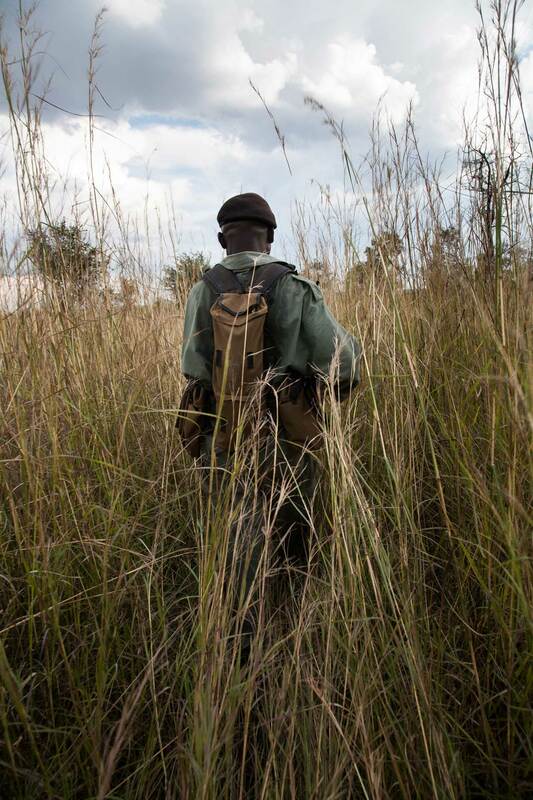 Veteran Ranger, Elliot Tshulu, strides into the bush during a daily patrol to track the rhino and check for snares. 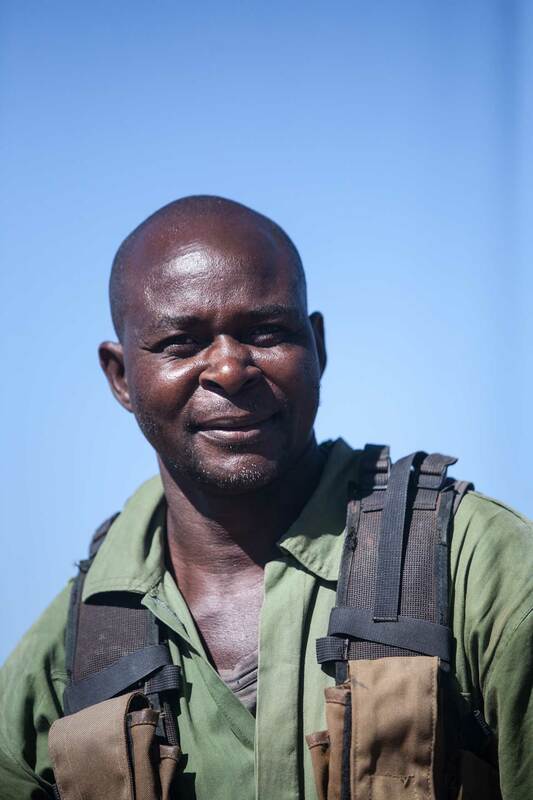 Elliot left a career in the Zimbabwe National Army to become a game ranger - he has been stationed on the reserve for over 20 years. 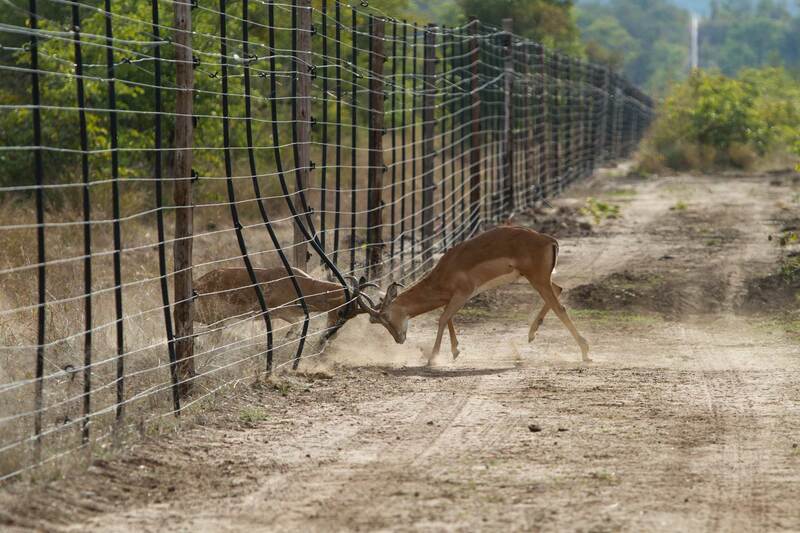 Male Impalas fight through the reserve's game fence. Rangers patrol the full 34 km length of the fence every day to check for breakages and make sure no one has entered the 3500 hectare property. 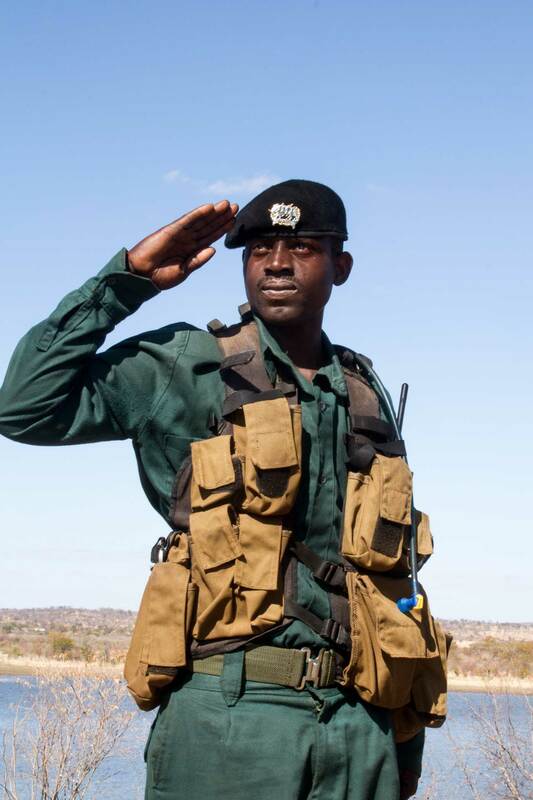 John Matengu stands to attention with other rangers. Matengu worked for the Department of National Parks for 37 years before reaching retirement age, but with a large family to support he could not afford to lose the job. 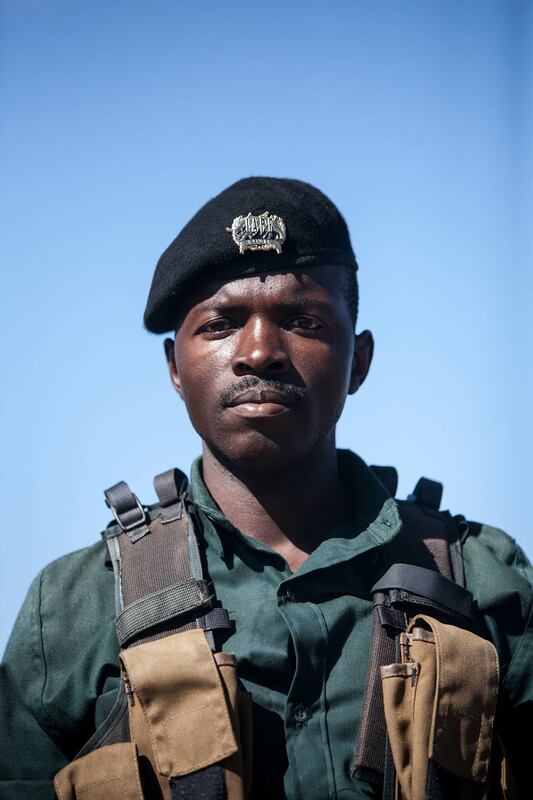 He was selected for training with the IAPF and is now employed as one of their permanent rangers. 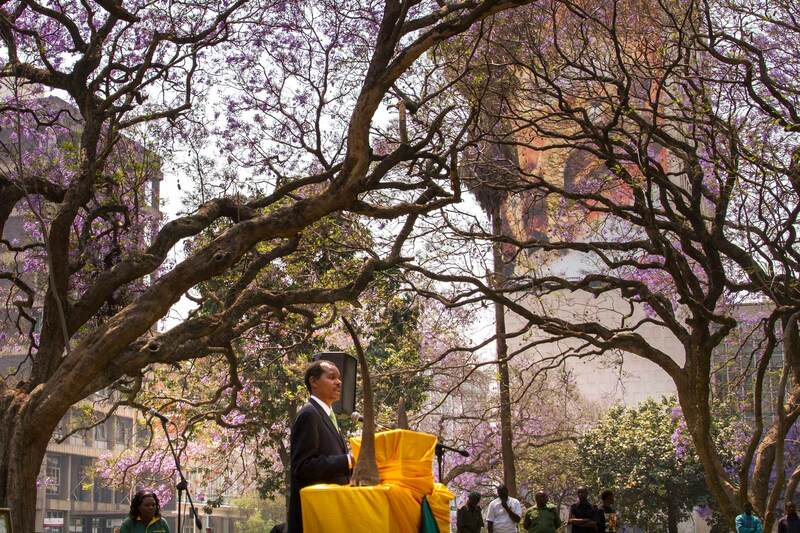 In Harare, former Minister of Environment, Francis Nhema, addresses a crowd during Rhino Day celebrations. Zimbabwe's centralised government structure makes it particularly difficult for conservation bodies operating in remote areas to function effectively as decisions have to be approved by National Parks in Harare. Foreigners, like the IAPF, are often treated with suspicion making the work even more challenging. 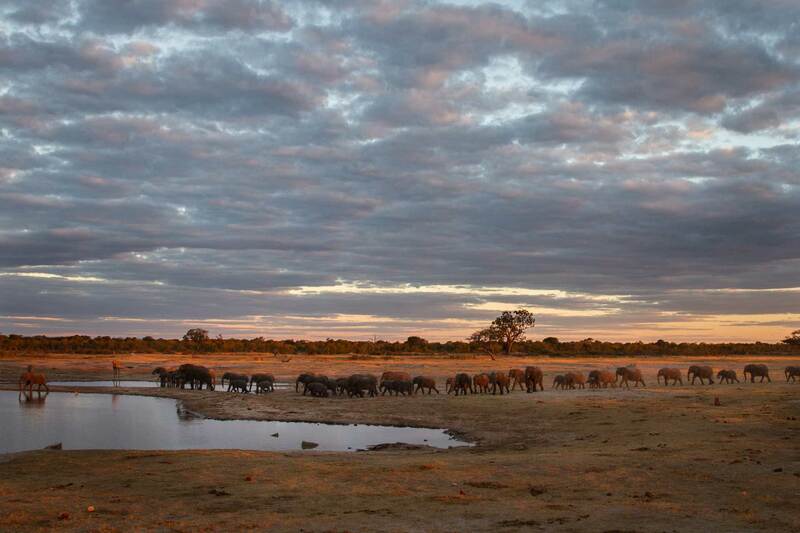 A herd of elephant arrive at Nyamandlovhu Pan in Hwange National Park for their evening drink. Zimbabwe's poaching problem has come to international attention recently after the poisoning of hundreds of elephant and the death of Cecil the lion which both took place at Hwange, about 1.5 hours outside of the IAPF's base in Victoria Falls. 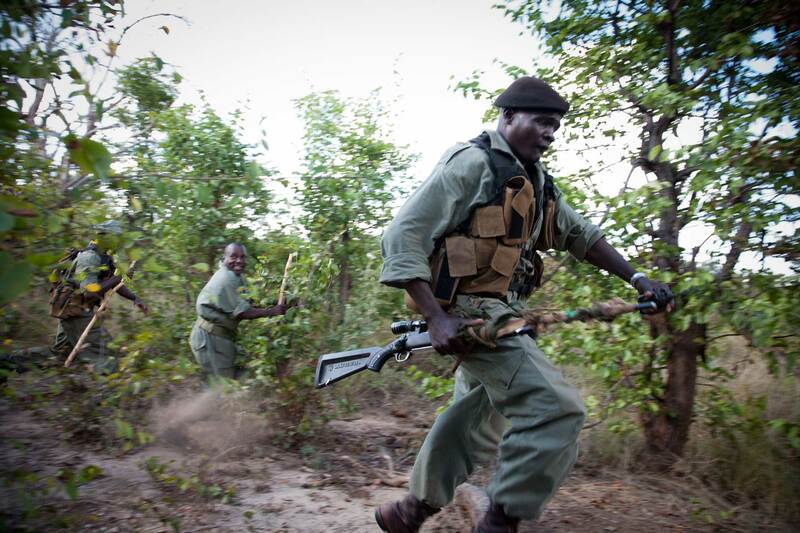 Fortunately on the reserve where the IAPF operates there has not been a serious poaching incident since 2009 and smiles belie a training exercise as Elliot Tshulu, front, leads a practice ambush to apprehend a cheerful 'poacher'. 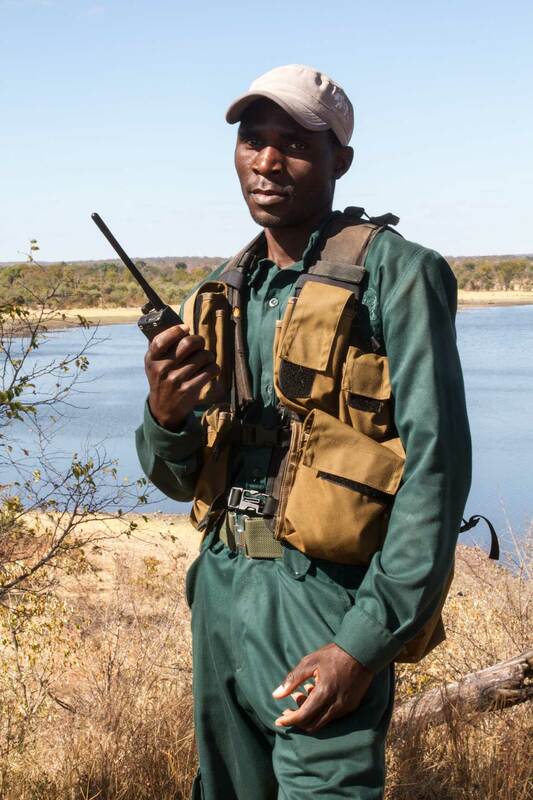 Last year Senzani Tshabangu was attacked by a crocodile on the reserve but managed to escape by hitting it repeatedly, losing only a thumb in the attack. Several other rangers have been injured by buffalo while performing their duties. One of Vusani Shoko's striking memories is meeting a lion during a solo morning patrol. The lion surprised him appearing 5m away in the bush, but wandered away after Vusani held his ground. 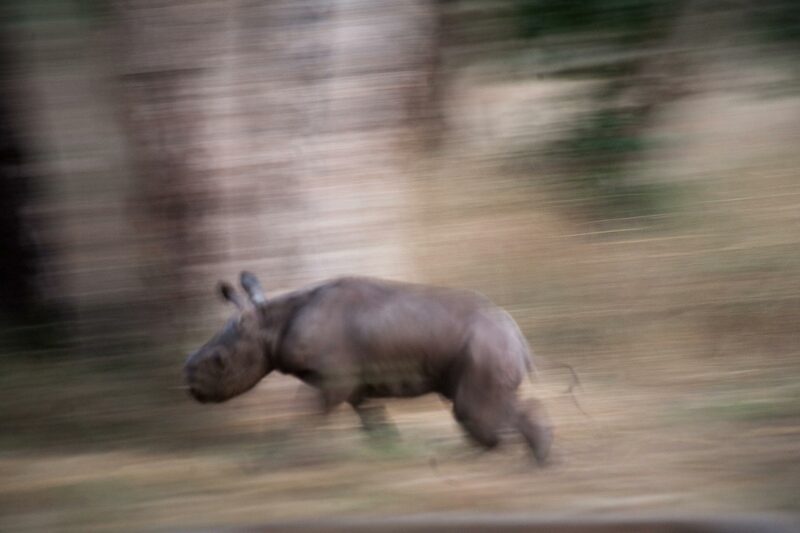 A week-old black rhino calf scuttles through the bush after his mother. 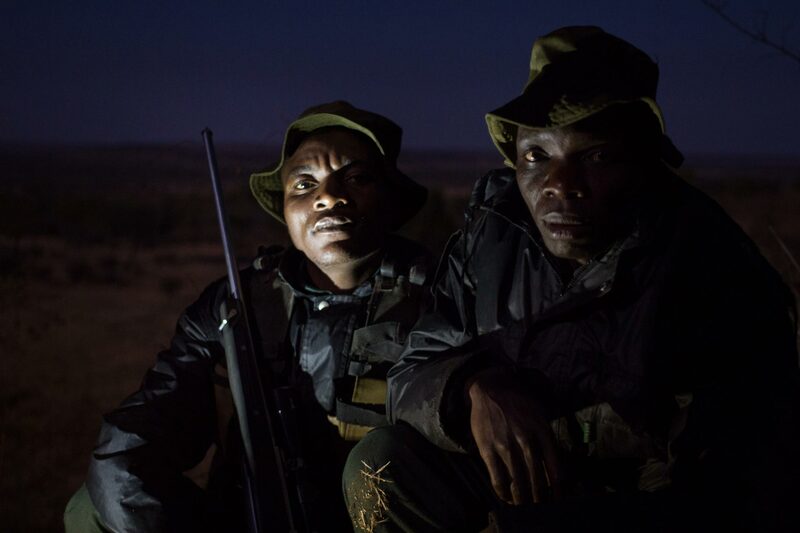 Thanks to the efforts and reputation of the anti-poaching unit, the property's rhino population has expanded from three to eight since 2009.